Plywood in various thicknesses is an essential material in modern residential and commercial building. Used for flooring, walls, ceilings and custom designed appointments in all rooms, plywood is a versatile, strong and relatively inexpensive building material. When building multilevel structures, however, comes the task of moving plywood from the ground up to the second floor. When a blueprint may call for 100 sheets or more of 4-by-8 foot 1/2-inch plywood, the job becomes very daunting. There are ways, though, to accelerate getting all those sheets up to where the nail gun is waiting. The easiest way to reduce the amount of work in moving plywood to the second floor is to precut the sheets to smaller sizes on the ground floor. This means moving smaller, lighter pieces. Although it may seem like getting one big sheet up the stairs will take less time, moving two lighter pieces causes less strain and can be just as quick. After all, if a worker has to stop halfway and catch his breath, then the large piece isn’t moving. 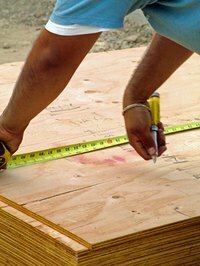 What’s more, usually a worker can make the additional trips faster than a carpenter or framer can get each piece installed. So the wood moves easier and the job stays on schedule. Another advantage of precutting is having the saw and work area in a safer operating location than right next to the installation site. This not only keeps everyone working safer, it eliminates problems with sawdust and getting power up to an unfinished section of the new building. If there is an open space in the wall of the second floor, then fashioning a quick hoist with a pulley and rope can move a lot of plywood quickly. Just like attaching a scaffold, add a 2-by-4 or 4-by-4 inch boom reinforced with a truss piece of 2-by-4 inch lumber at a 30-degree angle. On the end of the 4-by-4 inch piece, attach with a “U” bolt a pulley large enough to handle 1/2-inch rope. A tension grapple (closes when pulled, opens when released) can grab a whole sheet of plywood and lift it to the second floor very efficiently. Again, it keeps workers moving doing many light jobs repeatedly instead of one heavy difficult job once. If you need to move just a few sheets of plywood to the second floor and want to avoid the interior stairs, a makeshift ramp can do the job well. Just lay an extension ladder against the exterior wall and have it lead to an opening large enough for the 4-foot-tall sheet. Drop a line with a tension hook, grab the sheet and pull it up the inclined ladder. This works well for moving 5 or 10 sheets quickly. It also avoids errant plywood corners from damaging newly installed wallboard in the stairwell.